Tip: There are countless ways to string a racket. Rely on the experience of our professionals and choose our recommendation (middle). Get comprehensive advice online and choose your individual string. Benefit from the experience of our stringing professionals. Test this racket, first? - Click here! More than just a racket! 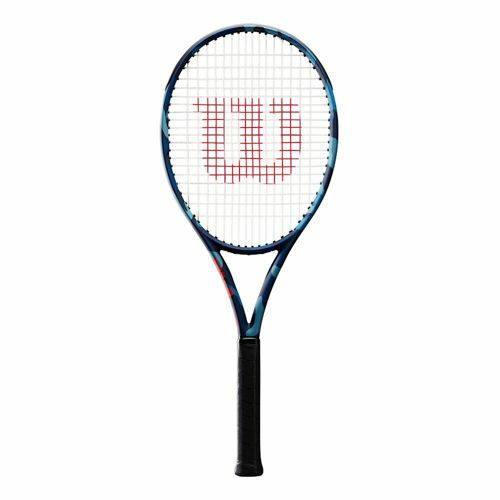 Behind the Wilson Ultra 100L Camo is a very special version of the sturdy racket. With a new, innovative design, Wilson has come up with something very special. The classic features of the Ultra 100L Camo blend with the camouflage design to become a true performer. Most important: You will never lose control. The racket not only lies loosely in your hand, but also follows your instructions. The weight of 277 grams feels so light that you can swing through the arm very quickly. Precise baseline strokes and perfect control are the consequences. Together with the strong design, this makes one of the most versatile and eye-catching clubs. Grab the Wilson Ultra 100L Camo and go on the court with a whole new feeling!